With the Ministry of Environment and Forests having made it mandatory for stone crushers operating in an area of over 5 hectares to get Environment Impact Assessment (EIA) clearance before granting them permission to operate, investors were running from pillar to post to complete the formalities. The Communist Party of India (CPI) has demanded a White Paper from the state government on the alleged large-scale distribution of land to industrial houses and other institutions in the state during the past four years. The Congress has refuted the BJP charge that it was politicising the financial crisis by demanding a White Paper on the financial situation of the state and asserted that with the state already under a debt of over Rs 27,000 crore, people had the right to know the facts. Residents, including parents of a missing girl, have expressed their concern over the failure of the police to trace 21-year-old Shashi Thakur, resident of Digho village in Choltara gram panchayat, who went missing under mysterious circumstances six months ago. Even as the departmental inquiry into the multi-crore pulses scam that has rocked the Food and Civil Supplies Corporation clearly points towards gross irregularities, the government has chosen to go slow on the issue with the two officials who have come under the scanner still not placed under suspension. The Food and Civil Supplies Department today directed the Shimla Municipal Corporation (MC) to confiscate the issued ration cards that the corporation had got printed from a private printer in violation of the laid-down norms. In an important move to woo the general classes, the government has decided to set up an autonomous commission for the welfare of the economically backward section (the Samanya Varg Nirdhan Kalyan Aayog) of the general category. Strongly objecting to the state’s plea for exempting the Chenab basin from the mandatory process of Cumulative Impact Assessment Studies (CIAS) for hydropower projects, several representative organisations of the local tribal people have urged the Centre not to allow any projects in the environmentally fragile region. A 20-seater helicopter undertook a flight between Bhuntar, Killar and Chamba, and back today to carry patients, officials and people. 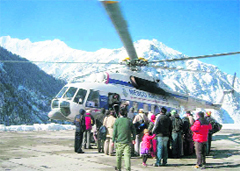 A helicopter at the Killar heliport that was used to carry patients, officials and people to snow-bound areas of Chamba. The Budget session of the Himachal Pradesh Assembly will be held from March 1 to April 6, 2012. Tributes were paid to Mahatma Gandhi on his martyrdom day across the state today. Hitherto locked in almirahs of the Language, Art and Culture Department, a large number of books, old manuscripts, files and other old documents, including some rare ones, will now be available to scholars and the public. Hamirpur MP Anurag Thakur today laid the foundation stone of the Lift Irrigation Scheme and also inaugurated a cattle dispensary at Kehdru. Chief Minister Prem Kumar Dhumal released a book titled “Man, Mountain and Architecture”, brought out by the office of the Architect-in-Chief, Himachal Pradesh, here today. Ashesh Sharma was unanimously re-elected president of the Press Club of Kullu here today. Journalist Jai Dev Vidrohi was the presiding officer of the election. Eleven houses were reduced to ashes in a devastating fire which broke out at Dharwas village in the snow-bound Pangi tribal valley of Chamba district last night, according to official reports reaching at the district headquarters town of Chamba today. The police registered a case of murder today at Badsar police station after a half-burnt body of a youth was found near Sulhadi village on yesterday. The district administration today succeeded in recovering the bodies of the five persons who had been buried alive under an avalanche at Pindi Nala near Bihali village in the outlying Churah subdivision of Chamba district since January 19 when they were crossing the area. One person was killed and another injured when their motorcycle collided with a JCB (Joseph Cyril Bamford) vehicle standing on the road near Bheod in the suburbs of Chamba town today, according to a police report received here this evening. The police has seized a huge quality of charas weighing 8.5 kg from the possession of Rajveer Singh who belonged to Bailey village in Kangra district today. Following these directions, officials of the Mining Department had directed stone crushers to merely utilise the piled-up stock and indulge in no fresh mining till they availed EIA permission. While the EIA will ensure scientific mining in an area, it will also put an end to over-exploitation, which leads to environmental issues. Though these restrictions were imposed in 2006 by the ministry, the state had not implemented these directions earlier. Investors were directed to obtain EIA clearance while being allowed to run their operations at the same time. This was, however, objected to by the ministry after a stone crusher owner from Nurpur was directed to shut his operations till the EIA clearance was obtained. The ministry while finalising the terms of reference had found that the stone crusher was operating without the EIA permission. While taking a strict note of the violation, the ministry had then sought a reply from the state government while directing them to suspend the operations of the stone crusher. The measure is, however, slated to hit the revenue generation sharply as the Mining Department earns almost 30 per cent of its revenue through mining of minor minerals. Though the final figures will emerge at the close of the current fiscal, an analysis of the figures of last year indicate that out of the about Rs 113-crore revenue, mining of minor minerals generated around 30 per cent of the total revenue, confided an official. Over 250 stone crushers operate across the state with Solan, Sirmaur and Kangra districts accounting for a sizable share. While obtaining EIA clearance was a lengthy process, it involved public hearing in the area concerned that involved the participation of the common man in the area concerned. Besides, in-depth environmental studies, along with measures, to offset the adverse impact of this activity were supposed to be undertaken, which was not just a time-consuming work but also required experts. A resolution to this effect was passed in the 12th district conference of the CPI, which concluded here yesterday. electorate of the state during the next Assembly election with the help of like-minded parties. CPI leaders said corruption had taken a new turn after the implementation of the new economic policy promoting privatisation and liberalisation in the country and, thus, the fight against the corruption had to be targeted against the new economic policy too, which was the fountainhead of corruption. Former state secretary of the CPI and veteran leader Basudev was the main speaker in this conference. In his address, he appealed to party workers to strengthen mass organisations and prepare themselves for agitations during the coming time. He said the party would discuss the political situation of the state in the state conference of the CPI, being organised at Nalagarh from February 10 to 12. A nine-member district committee was also elected in this conference and Mukesh Kumar was elected the district secretary of Hamirpur district again. General secretary of the Congress Kuldeep Rathore said the claim of the government that it gave financial benefits to the tune of Rs 5,300 crore to employees was misplaced as it was the responsibility of the government to pay salaries and dues. Moreover, the fact was that the government had still not paid the arrears of the pay revision amounting to Rs 1,200 crore. Further, even pensioners had not been given all the benefits after the pay revision, which reflected a dismal state of finances. The government was surviving on the funds being provided by the Centre, and under the MNREGA scheme alone over Rs 600 crore had been given. Though the police has failed to arrest the suspect (s) behind the crime since July 19, 2011, residents suspect that Shashi might be pushed into human trafficking trade or may be sold out of poverty. But her parents Meera Devi and Yashwant Thakur, working as MNREGA labourers, suspect that she was taken by a person from Bhoranj, who works in the Army at Jhansi, with a promise to marry her and the police knows the whole story. Meera Devi claimed that her daughter had told her that was going to the temple. Around 12.15 pm on July 19, 2011, Shashi called her on her mobile phone from the Awahdevi Temple in Mandi saying that she was going by a car with the intention to marry her boyfriend, she claimed in the FIR. But after that Shashi’s mobile was switched off. Meera never talked with her daughter till today after the incident. She did not know where she was, whether she was dead or alive. “The police did not lodge an FIR when we approached the Sarkaghat police on July 22 on the promise that they would recover the girl,” rued family members of the girl. It took three months to lodge an FIR in the case. Even after six months, the police had done nothing, they alleged. The police lodged an FIR on September 9, 2011, after they approached the Superintendent of Police, Mandi, under Sections 363 and 365, IPC. However, the police suspects that there was an alleged marriage pact between the two families in which some money transaction also took place. Though Shashi’s brother Moti denied that there was anything like that, residents expressed concern over the issue. Pradhan, Choltra gram panchayat, Vijay Laxmi said they were concerned over the whole episode and the police should go to the bottom of the case to unearth the truth. ASP, Mandi, HS Thakur said the police team had been dispatched to Jhansi with an arrest warrant to arrest the suspect. “The police will come to know about the whereabouts of the girl after producing the suspect in the local court soon,” he added. Almost a fortnight ago the report of the departmental inquiry was submitted to the government, but no concrete action has been taken so far. It is reliably learnt that the report has raised questions on the role of Civil Supplies Corporation officials for allegedly favouring a group of firms which formed a cartel to keep others out of the race to get the supply order meant for 16 lakh ration card holders in the state. “Though the exact amount will be worked out later, it appears that a loss of over Rs 7 crore was caused to the government exchequer by declaring the firms with lower rate as ineligible by imposing unnecessary conditions not even specified by the government,” said sources. One of this was the insertion of the word “required pulses” and making it mandatory for the firm to have its own processing and packaging unit. Food and Supplies Minister Ramesh Dhawala said having received the inquiry report today, he would ensure that action was taken against the erring officials as the government had suffered a huge loss worth several crores. Despite the Vigilance Bureau taking the entire record of the procurement of the three pulses meant for the public distribution system (PDS) into its custody, there has been no headway and the two officials though chargesheeted have not yet been suspended. It is still not certain whether the firms supplied the imported pulses actually lifted from Mumbai for Himachal or bought inferior quality pulses locally and supplied it for distribution under the PDS. The scam was unearthed in December when the minister on receiving a complaint found that gross irregularities had taken place in connivance with corporation officials. He terminated the order given to the firms from Haryana and Delhi and awarded the supply of pulses to a Delhi-based firm at a rate almost Rs 2.50 per kg less than being supplied by earlier firms. Following the unearthing of the scam, Dhawala has effected some major changes in the entire procurement process, including payment of Rs 25 lakh each for the three pulses as security along with a bank guarantee and insurance. The mandatory condition of having a processing and packaging unit has also been relaxed. l The old rates at which pulses were supplied for the PDS were Rs 825 per quintal for black urd, Rs 825 for black gram and Rs 433 for dal chana while the new rates are Rs 523, Rs 528 and Rs 344. Food and Civil Supplies Minister Ramesh Dhawala today directed the department staff to ask the local MC to destroy all the 1,000 ration cards, including those already issued to people, which it had got published on its own. While some of the ration cards have been issued to people, the rest are lying unused with the local body. “I have asked officials of the department to destroy the issued ration cards as well as those lying unused so that the ration cards printed by the Food and Civil Supplies Department are issued,” he said. He said the MC could not get ration cards printed on its own under Rules 14 and 15 of the Specified Article Control Order as it was the duty of the department to provide the same. Senior officials said it was the department that printed and supplied ration cards to the issuing authorities as it had the record of the exact number of cards printed. This, they added, automatically kept a check on fake ration cards and duplication. These cards, each usually printed at the rate of Rs 2.30 by the Food and Civil Supplies Department, were printed at Rs 15 per card by the MC, thereby causing a loss to the government. The decision was taken by the state Cabinet which met under the chairmanship of Chief Minister PK Dhumal here today. The commission will be a permanent body to examine all issues relating to the integrated development and welfare of economically backward classes and give suggestions to the government for envisioning new schemes and amendments to the existing schemes. It will also ensure all constitutional and legal safeguards for their protection. The Cabinet granted approval to the Atal School Uniform Scheme under which two pairs of school uniform will be provided to nine lakh students of government schools up to Class X annually in April and October in a year. It decided to constitute a committee under the chairmanship of the Additional Chief Secretary (Forests) and having the Principal Secretary, Finance, the Principal Secretary, Industries, the Principal Secretary, Food, Civil Supplies and Consumer Affairs, the Principal Secretary to the Chief Minister, the Secretary, Education, and the Directors of Higher and Elementary Education as its members for effective implementation of the scheme and procurement of uniforms by March 31. It decided to sell power available to the government from the Nathpa Jhakri hydropower station on a yearly basis through the bidding process and granted permission to the State Power Transmission Corporation to enhance its share capital limit from the existing Rs 50 crore to Rs 150 crore, besides enhancing the borrowing limit of paid-up capital and free deposit. Approval was granted to the proposal of the State Power Corporation for the creation of a separate category of project-affected family namely “MPAF-Shamlat” for the Renukaji dam project and made it eligible for providing grants, scholarships, sponsored admission to ITIs by amending the rehabilitation and resettlement plan of the project. It was decided to extend the Himachal Pradesh e-Stamping Rule-2010 to the entire state in a phased manner by authorising the Stock Holding Corporation of India to implement the process. It also extended the date for removal of dead stems of deodar trees in different parts of the state subject to the condition that the extractors will fill the pits and plant a minimum of three saplings of deodar in compensation for the removal of each stem. It was decided to make Jawaharlal Nehru Government Engineering College, Sundernagar, a constituent college of State Technical University, Hamirpur. The Cabinet granted approval to fill 187 posts of different categories for the establishment of five government polytechnics at Paonta Sahib, Kullu, Kinnaur at Kalpa, Bilaspur and Udaipur in Lahaul and Spiti, 156 ayurvedic medical officers on a contract basis and 12 posts of Civil Judge (Junior Division) by direct recruitment through the State Public Service Commission. Taking a serious notice of the letter written by Chief Minister PK Dhumal seeking exemption from the Centre for a cascade of hydroelectric projects proposed on the Chenab and its tributaries, these organisations have shot a strongly worded letter to the Union Ministry of Environment and Forests alleging that the government was bent upon “killing the only living river” left in the state by proposing 20 projects to harness 3,000 MW of power. A preliminary report entitled “Beginning of the End” on the Jispa Dam and other hydropower projects in the Chenab basin highlighting their disastrous environment fallout prepared by the Him Dhara Environment Research and Action Collective has also been sent along to enable the ministry to know the consequences. The Jispa project alone will submerge an area of 12 sq km of the narrow cold desert valley adjacent to Ladakh, which is not only ecologically fragile but also geologically and seismically sensitive. The reservoir will submerge 10 villages and also wipe out the natural resource base which sustained the livelihood of the tribals. The structural safety of such big dams in the area with unstable geology, prone to avalanches and landslides, and proximity to China border will be a matter of concern. The campaign of the tribals is being spearheaded by the Jispa-Darcha Bachao Sangarsh Samiti and supported by the Him Lok Jagriti Manch, the Gramin Yuva Sangharsh Samiti, Udaipur, and various local panchayat bodies, besides Him Dhara. The first three projects, Miyar, Seli and Jispa, are in different stages of clearances and Miyar already has been recommended for environment clearance despite serious objections raised by local communities during a public hearing. “There was no independent carrying capacity study or assessment of the environmental impacts of the cascade of projects that are coming up in the state and until and unless this process is carried out, there should be no further commissioning and clearance to the projects, asserted Prakash Bhandari of Him Dhara. In the wake of the recent heavy snowfall in the mountainous tribal areas, which are almost cut off from other parts of the state, the state government had announced to arrange helicopter flights for carrying patients, officials and people residing in the snow-bound tribal areas. A resolution recommending to the Speaker to convene the session was unanimously adopted by the state Cabinet, which met here today under the Chairmanship of Chief Minister Prem Kumar Dhumal. There will be a nine-day recess from March 17 to 25 during which the committees of the House will scrutinise the demands relating to various departments and submit reports. Chief Minister Prem Kumar Dhumal led people of the state in paying the homage to the Father of the Nation and other martyrs. He offered flowers at the statue of Mahatma Gandhi at the Ridge Shimla. Leader of the Opposition Vidya Stokes, president of the state BJP Khimi Ram, MLA Sohan Lal, Chairman, Agriculture Produce Marketing Committee Gyan Chandel, government officials and other prominent citizens also paid floral tributes. A session for patriotic songs was also held and earlier in the day. Prabhat pheris were also taken out in which a large number of people participated. A two-minute silence was observed to mark the day and in the memory of those who gave up their lives in the struggle for India's freedom at the Raj Bhawan. The department has decided to set up two libraries, one in the state museum and the other in its archive section, so that those interested can access these like other libraries. However, the rare documents, manuscripts and books will not be issued to members or scholars, but they will be allowed access to these so that they can gather the required information. The library at the state museum will have unique interiors marked with ornate wood carvings, providing a glimpse of the hill architecture and lending it the ambience of a monastery. There will be no chairs or tables like other libraries and the scholars will sit on the floor in the traditional monastic style for which mattresses will be provided. Though small with just about 6,000 books, the library being set up will be a rich resource for scholars and all those keen on knowing about Himachal Pradesh, its people and culture, says Rakesh Kanwar, Director of the department. It will have books on archaeology, temples, historic monuments, Pahari miniature paintings, handicrafts, history, culture and all other aspects of the hill state and its people. The repository will also include old district gazetteers, travelogues and other publications of the British era which provide in-depth knowledge about the hill culture, flora and fauna and other resources. The second library is being set up in the archive section which has been shifted to the main department in Kasumpti. Both the libraries will be opened next month. There are a host of documents, including about 20,000 old files, a majority of which pertain to the Shimla municipal committee of the pre-Independence era. They reveal much about the meticulous planning the British carried out while developing the hill station as the summer capital. Addressing a public meeting after the function, Anurag said the state government had spent over Rs 53 lakh on water schemes in Dharog panchayat during the past four years, besides installing four hand pumps. He said after the completion of the Lift Irrigation Scheme at Kehdru, 47 hectares would be irrigated, which would help in improving the irrigation facilities in the area and enhance yields of agriculture and horticulture crops. The MP said the efforts were also being made to generate employment for unemployed youth in the district and polytechnic institute, Hamirpur, was giving free training to youth to upgrade their technical skills. The book published under the guidance of Vishwakarama awardee Vijay Uppal, Architect-in-Chief, contains photographs and architectural details of important buildings across the state designed by the architectural wing of the state. It exhibits the best of the architectural monuments created by the department. The Chief Minister lauded the efforts in bringing out the book and said Himachal, being a hilly state, required different architectural parameters to create infrastructure keeping in view the climatic conditions of the area specific. He said undoubtedly the architects of the state had been successful in incorporating ethnic traditional hilly architect with modern designs to construct buildings, bridges and other structures in the state. He underlined the need for designing buildings which were eco-friendly, energy efficient, with solar passive features, earthquake resistant, cost effective and suitable for the local climatic conditions. These should also have rain-harvesting structures. Uppal thanked the Chief Minister for releasing the book and briefed him of its contents. The other office-bearers were also elected unanimously as under: senior vice-president - Rajesh Sharma; vice-presidents - Manu Sharma, Pankaj Handa and Dhanesh Gautam; general secretary - Ashish Sharma; treasurers - Nitin Sharma, Kartar Kaushal and Sumit Chauhan; and chief patron - Rajiv Sharma. The report revealed that 25 families had been rendered homeless as a sequel to the fire incident, adding that the loss caused due to the fire had been put at approximately Rs 80 lakh. All the belongings of the inhabitants of the village had been destroyed by the fire, the report informed. A case had been registered by the police to ascertain the cause of the fire, the report added. SP, Hamirpur, Kuldeep Sharma, after visiting the spot, said, the body, which was lying half burnt near a well at some distance from the village, had been identified as that of Ashwani Kumar (35), a local villager. The body had been sent for forensic investigation to Tanda medical college after the registration of a case under Sections 302 and 201, IPC. Deputy Commissioner (DC), Chamba, Sharabh Negi over the phone said here today that the search operation to extricate the bodies from under the avalanche could be successful with the involvement of local youths. “It was only owing to the determined endeavours of the local youths and the sunshine, the huge mass of snow could be removed to find the bodies,” the DC asserted. The deceased had been identified as Lal Hussein, Usuf, Mohammed Rafi, Abraham, all local residents, and Baag Hussain of Jammu and Kashmir. The Deputy Commissioner said an immediate relief of Rs 10,000 each to the next of kin of the deceased had been disbursed. The report stated that the deceased had been identified as Narender Kumar and the injured as Nitin Kumar who had been rushed to the hospital for undergoing medical treatment. The bike riders belonged to nearby local areas. The police had registered a case of rash and negligent driving under Sections 279, 337 and 304-A of the Indian Penal Code at Sadar Chamba police station, the report further said. Giving this information here today, Superintendent of Police (SP), Chamba, Madhu Sudan Sharma said the accused Rajveer Singh had been arrested and a case under Section 20, NDPS Act, had been registered at Tissa police station. The SP said when a police party was on a patrol at Gunu Nala in the district, the police officials intercepted a passerby and on searching his luggage recovered 8,500 gm of charas.